You might be an accomplished do-it-yourselfer, and you might have tackled more than one DIY project at home without any help. That doesn’t mean that you should do every job on your own, though. If you’re going to be installing new flooring in your home, you might be thinking about doing it yourself. You might just find that hiring a professional from a local flooring company is better when installing hardwood floors or other flooring. Here’s why. If you think that installing the wood flooring in your home is going to be a fast and easy job that you can tackle over the weekend, you might want to think again. If you’re only replacing the flooring in a small area of the home, this might be true. If you’re replacing all of the flooring in the house, though, your experience is probably going to be different. You have to worry about pulling out your old flooring, making sure that your sub-flooring is ready for your new hardwood floors, putting down the flooring itself and more. All of these things can take hours to do. If you’re someone who has a lot of time on your hands, then installing your own wood flooring might not be a big deal. If you’re a busy person who’s short on time, though, you might find that it’s a project that is just too time-consuming for you to tackle on your own. Next, you have to think about the equipment that is required to install hardwood flooring. You have to be able to cut the materials when installing wood flooring. You’ll also need a drill and drill bits, a flooring nailer and various other tools and equipment. Buying all of these things just to install your hardwood floors can get expensive, and you might save more by just hiring a flooring company to do the job rather than buying everything to install your hardwood floors yourself. Then, you don’t have to worry about learning to use your new tools or storing them after the job is done, either. 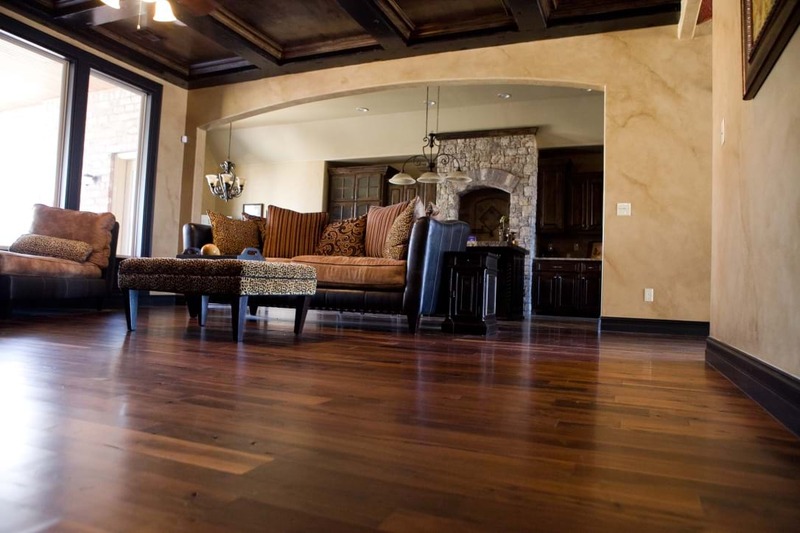 Your hardwood floors are supposed to look beautiful when they’re installed. If you don’t know what you’re doing, though, it’s easy to make mistakes that could leave you with a project that doesn’t have the look that you were hoping for. If you cut the flooring pieces wrong, don’t make sure that the subflooring is clean enough before putting them down or make other honest mistakes that newbies can tend to make when tackling this big project, then the results of your project aren’t going to be the same. If you hire a professional flooring company, though, you can make sure that your wood flooring looks fantastic when the job is done. One thing that you might not realize is that if you don’t have your flooring installed by a flooring company, then the warranty on your flooring might not be valid. Some manufacturers require you to have a professional installation from a flooring company in order to use the warranty later. This will be disappointing news if something goes wrong with your flooring and you don’t find out about it until it’s too late. To make sure that any warranty that comes with your flooring is still valid, make sure that you ask about this prior to installation. If it’s required or if you just want to make sure the job is done right, you’ll probably want to hire a flooring company rather than doing it yourself. As you can see, even if you’re thinking about installing your own wood flooring instead of working with a flooring company to get it done, you may want to rethink the idea. Even though some people do install their own wood floors and are happy with the results, it’s generally better to hire a flooring company to install your hardwood flooring for these reasons and more.